CooksRecipes has quality, kitchen-tested recipes for bruschetta, crostini and other flatbread appetizers that are perfect for parties and entertaining. 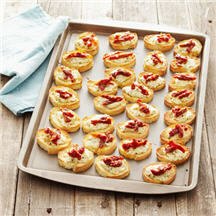 This recipe for crostini features a wonderful flavor combination of sun-dried tomatoes, goat cheese, Parmesan cheese and Gruyère cheese. 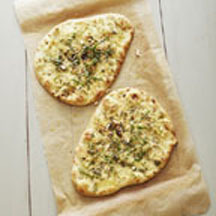 This rosemary, garlic and pesto-flavored flatbread is delicious, quick and easy to make. Great with pasta main dishes or a green salad. 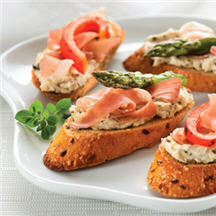 Add a touch of Tuscany to your meal with this simple, yet elegant crostini appetizer.